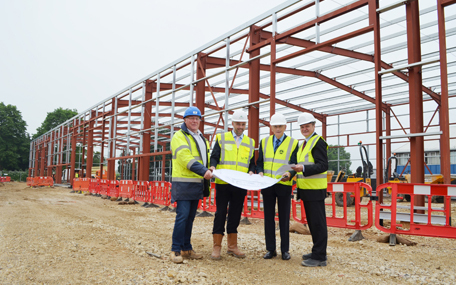 Construction work is well underway on six new industrial units in Terminus Road, Chichester, to help boost the local economy. This is the second building project on the Terminus Road Industrial Estate that has been commissioned by Chichester District Council to support local businesses. The £2 million industrial units are based on Plot 21, which was previously home to Goodwood Metalcraft. The redundant building, which was no longer suitable for modern business needs, was demolished to make space for the new units, which are on track to be completed by October 2018. Each unit will provide between 230 and 300 square metres of floor space, plus the potential to add a mezzanine floor, at a tenant's discretion. There will also be the option for each business to dedicate some space to a trade counter area. It is predicted that each unit will employ around five people. As well as encouraging business and providing new employment in the district, the scheme will also help generate rental income for the council, helping to protect key services for residents across the district. Councillor Tony Dignum, Leader of Chichester District Council, said: "I'm very pleased to see this excellent new facility taking shape so quickly. One of the key aims of this scheme is to improve the area's economy by attracting new employers. It could also provide an opportunity for existing businesses in the area who are seeking to expand and move to new premises. "Because the site is owned by the council, the rental income will go towards helping the council provide key services for our residents. "This project will add to our portfolio of business accommodation, allowing us to offer a variety of options for local businesses. The new Enterprise Centre, located in Terminus Road, has just opened, plus we also currently offer other options at the Woodruff Centre in Terminus Road and the St James' Trading Estate. Simon French, Managing Director of Mildren Construction, the company chosen to build the new industrial site, adds: "Mildren Construction are pleased to be working on this exciting scheme with Chichester District Council. The new facility will provide a fantastic, modern working environment for a multitude of businesses, close to the city centre and excellent transport links." Businesses interested in finding out more about the new units should contact the council's estates team.